NEW YORK – Hello Giants Fans, would you like to meet Justin Tuck and get some valuable football knowledge from the man himself? I might be able to help you out with that. I have a very cool opportunity for some of you Giants fans out there. 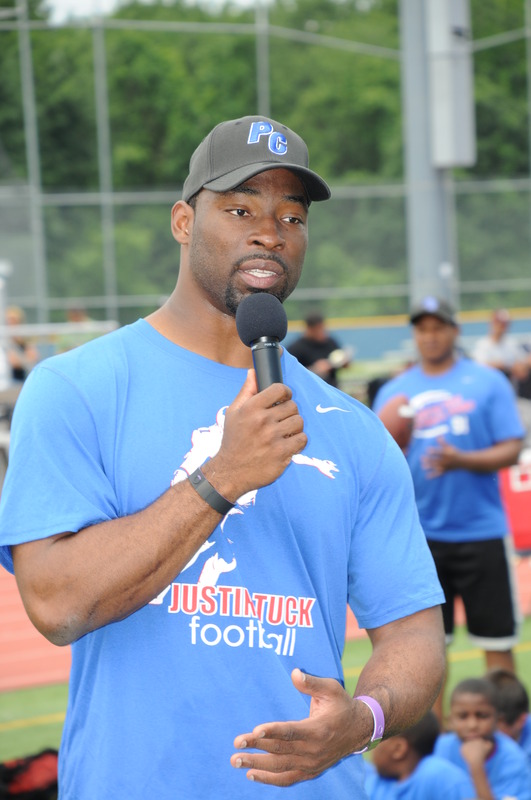 I’m sure that most of our readers saw the article I wrote about a week ago concerning Justin Tuck’s ProCamp football camp for kids. It looks like they are doing something special for the holidays and offering some upgrades at a reduced price. I think this is an excellent chance for parents to treat their kids to a once in a lifetime opportunity. All of the information is available on their website Justin Tuck including schedule and pricing. I remember getting to meet the New York Giants at Giants stadium for some trip we took as kids while playing local football. I was in the 8th or 9th grade in school but it still feels like yesterday. Tis’ the season to be jolly and I’m getting this for my Godson as a stocking stuffer. He is really into sports and will love this. Please remember, the dates have not yet been determined. 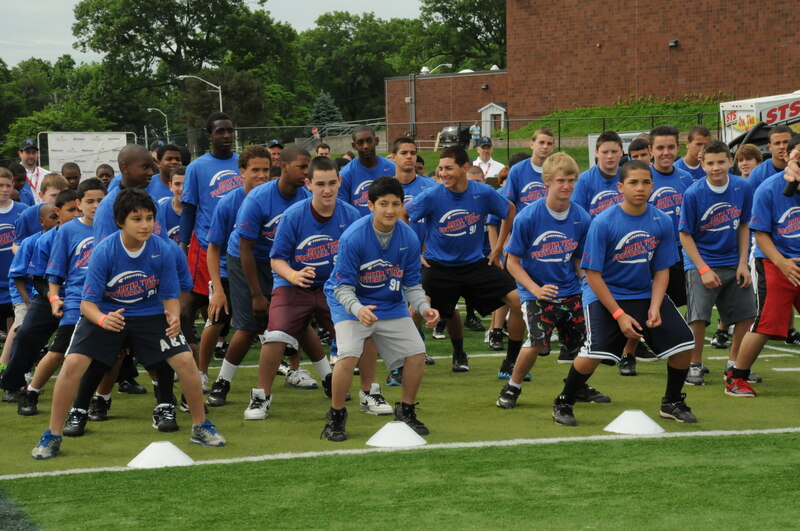 You will be notified of the camp dates, which will be in 2012. If it happens to rain on one of the days you’re attending camp, all kids and parents will be brought to a nearby indoor facility and they will hold camp there. There will also be a camp store for snacks, drinks and merchandise nearby. You can pre-order a ‘camp bracelet’ for the kids which is basically a lunch bracelet for an additional $10. The bracelet includes 2 sports drinks, lunch and 1 snack, each day. The price for the 2-day camp itself is $149 per kid, which is basically dinner and a movie these days for couples with children. Welcome to DAC Day 3! Holiday offer ends on December 9, 2011. Regular orders still taken after. Camp will be held in Mahwah, New Jersey. Justin Tuck has played his entire career with the New York Giants since being drafted by them (3rd round, 74th overall) in 2005. The Notre Dame product is a 2-time Pro Bowl player and Super Bowl Champion. He was born in Kellyton, Alabama. Tuck is also heavily involved with charities and community programs. Be sure to check out this special opportunity and have fun. 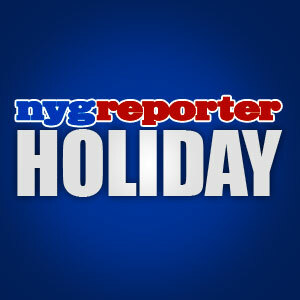 NEW YORK – The New York Giants are 6-2 and in first place of the NFC East. Things could not be going any better for them at this point in the year, they are coming off an emotional win against the New England Patriots and facing the elite teams on their 2011 NFL schedule during the next few weeks. I am very pleased to see them winning games. They are winning games even when they are not playing very well or fielding their best players. 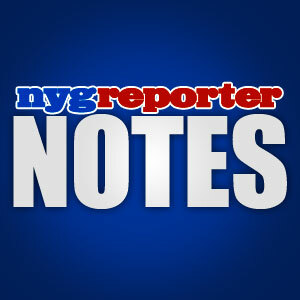 I have tremendous confidence in the G-men and most of our readers could confirm that fact. But even I thought the Giants would be having a much tougher time then they seem to be having. I never lost faith but was very concerned about the depleted squad. The Giants have made believers out of everyone, including the haters. Some of the football “experts” will say the Giants haven’t played any elite teams yet or the level of competition has been subpar. My message for those people is to just be quiet, take a look at every single NFL team schedule and you will see a balance of good and bad teams. People need to start giving the Giants credit for what they have done with a completely decimated roster. I’m sick of the New York bashing that fans have to endure with these television programs, who give too much personal opinion and not enough factual accounts of the events that take place. Even the haters out there cannot deny the fact that Big Blue is in first place and cruising through their schedule. I’m not being egocentric but simply stating the facts of the Giants current situation. It was nice to see Archie Manning come out and voice his displeasure with the Joe Buck and Troy Aikman FOX Sports pairing, that can’t seem to help bashing the Giants at every possible opportunity. Fans have been extremely vocal about their displeasure with this situation and Papa Manning validated what we were all thinking. I am here to report that the state of the New York Giants is strong heading into week 10. The Giants have four difficult opponents coming up starting with the revamped 49ers this weekend. This is a game that Big Blue can absolutely win. The 49ers have a very good defense but so do the Giants. If it comes down to the quarterbacks having to win the game, which I think it will, I’d take Eli Manning and wouldn’t look back. I’m not taking San Francisco lightly because they are a good football team but I still think the Giants “shock and awe” road tour will continue with another victory. My final score prediction is Giants 19 – 49ers 13. 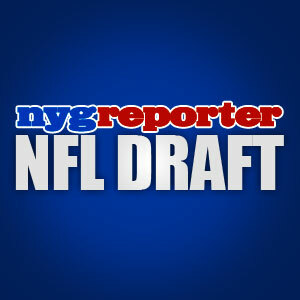 What are your thoughts about the Giants performance at the halfway point of the 2011 season? Side Note: I would like to say RIP to a boxing legend, Joe Frazier. One of the greatest boxing champions in history! 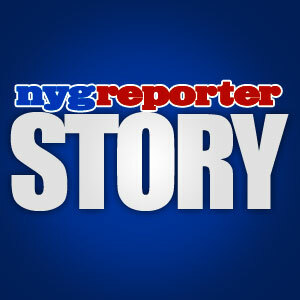 NEW YORK – The Giants went into this game today without a few of their star players (Nicks, Bradshaw and Baas). This would have been a tough game even at full strength with the way New England has been playing. The Giants really needed this win to create more of a separation from the pack in the NFC East. Not only did the Giants beat the Patriots 24-20, they did it in dramatic fashion with only 15 seconds remaining in the fourth quarter. This game was without a doubt the greatest game to watch all season for Giants fans so far. My heart was in my throat for most of the game and the final drive nearly gave me a stroke. The Giants improve to 6-2 on the season and continue to hold onto first place in the NFC East. The first half of this game was a defensive battle. Nobody expected these teams to go into the locker room at halftime with the score tied 0-0. Even I was wrong about the shoot out that I predicted would happen. There wasn’t any scoring but it was a fun defensive battle to watch with lots of turnovers in this game. The second half was a completely different story, with all 44 combined points scored in the second half. The special teams performance for both teams was atrocious today. There was also too many penalties once again but a win is a win. The G-men took care of business and will face another tough opponent next week when they play the 49ers in San Francisco at 4:15 PM EST. There is a reason why the TV networks called this the “Game of the Week”. Both of these teams fought hard the entire contest and it truly could have gone either way in those final seconds of the game. I’m glad the Giants were able to beat the Patriots today because it is deeper then the surface stuff. This was New York versus Boston to a lot of people, so put another notch on the win belt for the Greatest City on Earth! 18-1. QB Eli Manning – Eli Manning is an elite quarterback in the NFL, period. He finished the game with 250 yards 2 TD’s and 1 INT. RB Brandon Jacobs – Brandon the Bull stepped up today and ran the ball hard. He finished with 72 yards rushing, 28 yards receiving and 1 TD. DE Jason Pierre-Paul – JPP was able to play today and came away with another sack. This guy is a machine. WR Mario Manningham – Super Mario stepped up today and finished with 33 yards and 1 TD. LB Michael Boley – Boley is simply a beast and has become one of my favorite players on the team. He led all tacklers and had 1 sack and 1 forced fumble. DE Osi Umenyiora – Osi had a solid game and was in on a bunch of key plays. He was also in a fight with Patriots player Matt Light. WR Victor Cruz – This Jersey Kid is stepping up each and every week. He lead all WR’s and finished with 91 yards. LB Jacquian Williams – The rookie LB had his work cut out for him today and handled himself very well. TE Jake Ballard – Ballard is quickly making a name for himself throughout the entire NFL. He continues to move up the TE rankings and finished with 67 yards and 1 TD. S Antrel Rolle – Rolle left the game for a while but returned. He had a solid game and continues to ball on opponents. RB Ahmad Bradshaw – Bradshaw did not play in this game and is nursing a broken bone in his foot. Get well soon AB! 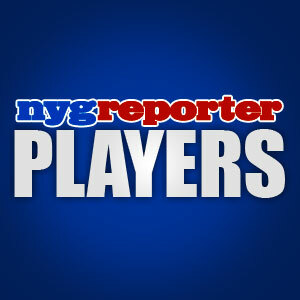 WR Hakeem Nicks – Nicks did not play in this game because he is dealing with a hamstring injury. Get well soon Hakeem! C David Baas – Baas missed another game due to injury and really put Manning in a tough spot. Get well soon David! S Kenny Phillips – Phillips was the second leading tackler on the team and had another great game. DE Justin Tuck – Tuck made his presence felt on the field and knocked Brady down a few times. WR Ramses Barden – Barden was taken off the PUP list and got involved today finishing with 22 yards. CB Deon Grant – Grant was simply making plays all over the field today. He finished with 1 INT. LB Mathias Kiwanuka – Kiwi was playing like a man possessed today and finished with 1 INT. CB Prince Amukamara – The rookie CB will have to wait at least another week for his debut. P Steve Weatherford – The Weatherman had an outstanding game today. He is a bright spot on special teams. K Lawrence Tynes – Tynes made his 1 FG attempt and all 3 of his extra point attempts. He has played well this year. Giants Defense – The Giants D came up huge in this game. They finished with 2 sacks, 2 INT’s and 1 forced fumble. Giants Offense – For a squad that lost 3 key starters (Nicks, Bradshaw and Baas) before game time, they did an outstanding job today. Giants Special Teams – This group still needs a lot of work and the returners had a horrible day dropping a couple of kicks/punts. What did you think about the Giants performance against the Patriots? You are currently browsing the archives for the Giants Injuries category.